Wednesday already?!? You know what that means, a new challenge from Cuttlebug Challenge. This week's challenge is to make a school project & use your Cuttlebug. Our sponsor this week is Cosmo Cricket. I got to play with the Lil' Man paper collection and I love it. It was perfect for a school project. 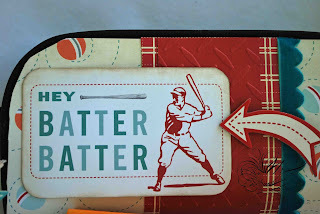 I decided to make a pencil holder for a little boy, using a baseball theme with my Cuttlebug & the new Diamond Plate embossing folder. The Diamond Plate is perfect for sports themes. All of my supplies are from Cosmo Cricket (even the fab ribbon), Provo Craft, and Core'dinations. I bought a cheap pencil holder at Wal-Mart and used my cutting knife to cut out the shape of the pencil holder. I then covered it with the paper and added a strip of embossed paper around that and a ribbon edge. I then added a Cosmo Cricket tag, that I inked around the edges with MS ink and added Cosmo Cricket chipboard. 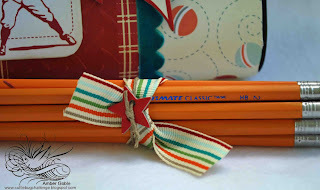 I also tied a ribbon around my pencils and added a chipboard star that I tied on with twine. I then wrapped my glue stick with patterened paper and added ribbon and a chipboard star. Now I have to make a confession as to why I went with a baseball theme. My little Jack Russell Terrier, Jake, is obsessed with balls. We always have to take a supply with us on vacation and they always seem to get misplaced....not anymore:) This handy dandy pencil holder is pulling double duty as Jake's ball carrier. Be sure to visit Cuttlebug Challenge to see all the beautiful creations by the DT! And today is a new challenge at DCRU: use a date as the focus of your card, LO, or altered project. Visit the DCRU DT Blog to see all the inspiring creations from the DT. Plus there is a prize for this week's winner! 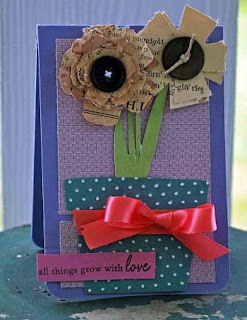 Visit the Die Cuts R US DT Blog to see my mini tutorial on homemade flowers! Wednesday's mean a new challenge at the Cuttlebug Challenge Blog. This week's challenge, make a shaped card, LO, or project. The DT was sponsored by Paper Popsicles and we had the opportunity to play with their card templates. All you have to do is buy a template and download it to your PC and print. So easy! I used my Cuttlebug and the new Herrigbone & Swiss Dots folder. I used Core'dinations paper. I highlighted my Swiss Dots with Sakura pens to look like sprinkles. I used Papertrey Ink ribbon & stamps. 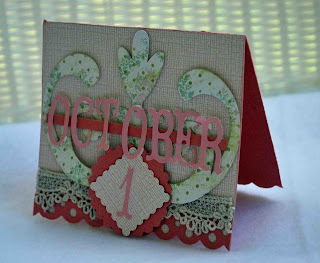 Today's Tuesday and that means a new challenge at Die Cuts R Us DT Blog! 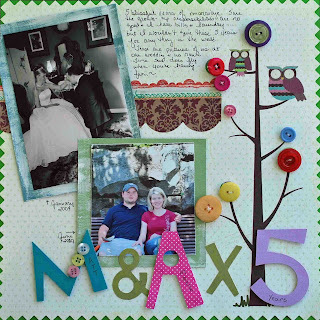 Today's challenge is from Margie, a color challenge. The colors are Chocolate Brown, Teal, White or Ivory. And incorporate an image in your card using these amazing colors. I used Core'dinations, My Mind's Eye, and EK Success paper. I used stamps from Papertrey Ink. Copic Markers and Martha Stewart Ink. My Spellbinder Nestabilities and my Cuttlebug, using the Swiss Dot Folder. I highlighted all the products that you can find at the DCRU store. Also at the DCRU Store, Copic Markers are on sale for $2.99!!! Take time to visit the DCRU DT blog and look at all the beautiful creations the DT made this week. And be sure to play along! It's that time again! A new Cuttlebug Challenge! This week's challenge is to make a scene card! This was a really tough challenge for me because I had never tried a card like this. 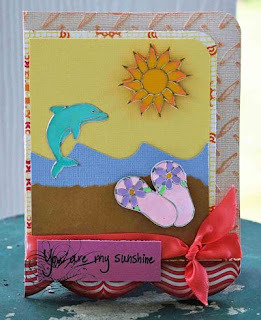 Visit Cuttlebug Challenge Blog to see examples of the DT's scene cards. I use my Cuttlebug & the new Diamond folder from Provo Craft. I also used Sakura of America Souffle pens and stickers. I used Core'dinations Whitewash paper, which I embossed and then sanded to let the color thru. I just love this paper, it is the best I've found for embossing! I also used Sassafrass Paper, Papertrey Ink Stamps & Ribbon, and Martha Stewart Ink. Be sure to stop by Cuttlebug Challenge to check out the amazing creations from the DT. Our sponsor this week is Sakura of America so play along for your chance to win a great prize! I also used Papertrey Ink & Core'dinations paper, Cuttlebug & Swiss Dots Folder (available at DCRU store), Papertrey Ink stamp, and Papertrey Ink ribbon. My flowers are vintage that I made with an old book, tune in to the DCRU DT blog on August 20th to see my mini tutorial on this! 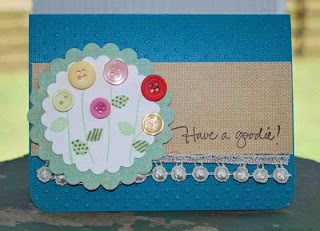 Just wanted to post a little card I did yesterday with my new Papertrey Ink stamps "Everyday Button Bits". 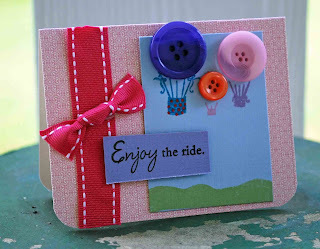 I just love using buttons so I was tickled pink when Papertrey made a line of stamps that include buttons! I used Papertrey Ink & Core'dinations paper, Papertrey Ink Stamps, Martha Stewart Ink, Copic Markers, and Papertrey Ink ribbon. Tune in Tuesday for a brand new challenge from Die Cuts R Us. And Wednesday is the new Cuttlebug Challenge for the week. 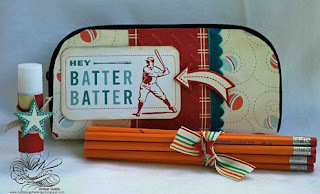 And check out the super giveaway at Crafty Goings On - Copics!!! DCRU is having a giveaway, go to the DCRU Design Team Blog and enter for your chance at free Just Rite Stamps! Wednesday already! This week's Cuttlebug Challenge is to make a card with a digi stamp. Go to Cuttlebug Challenge to see how to get a free digital stamp! I had so much fun with this little card. I used the new Cuttlebug embossing folder Moroccan screen by Provo Craft. It is just so elegant and I instantly fell in love with it! I used Coerdinations solid cardstock and Whitewash collection. I also used my Cuttlebug & the Swiss Dots folder on the Whitewash paper and then sanded it to let the color come thru. I used Melissa Frances paper and embellishments. 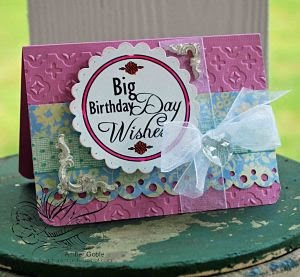 I used Martha Stewart Scalloped punch. And then I added a random ribbon and bling to finish it off. I colored my digi stamp with Martha Stewart markers. See the little thing I've got my card setting on, it is an old churn that belonged to my Great Grandma. It makes a great prop for my cards! Now visit Cuttlebug Challenge to see the beautiful projects the DT made this week! 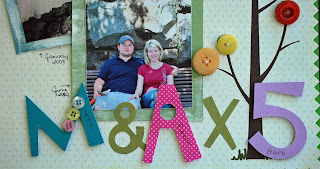 Today we start our challenges at Die Cuts R Us DT blog! The design team has amazing ideas and surprises in store for you! Our first challenge is by Sammye Jo. 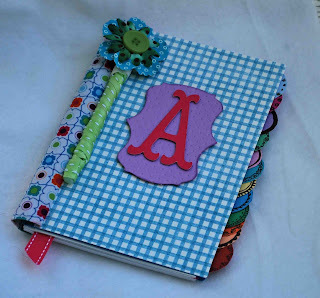 It is to make a project, card, or LO and include a monogram. "M & A X 5" stands for Matt & Amber x 5 years. That's how many years we've been married. I thought it sounded like a math equation. I used my Cricut & the Cuttin' Above Cartridge. I also used My Mind's Eye, Papertrey Ink, and Colorbok paper. I used a picture from our wedding day and a picture from this summer to make this LO full of sweet memories for me. 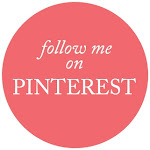 Don't forget to visit Die Cuts R US DT blog and the Die Cuts R Us store. Today's an exciting day for me! I am honored to have been invited to be a part of the first Die Cuts R Us Design Team! If you are not familiar with DCRU, it is an amazing online scrap store with so many great deals! Believe me, if you are a die cut fan, visit this site. Claudia, the owner, has the BEST deal on Cricut cartridges! And she has many Provo Craft goodies that can be preordered. If you are looking for a shop that is up-to-date and super cute, you'll loveeee this place! Now a little about the Design Team. 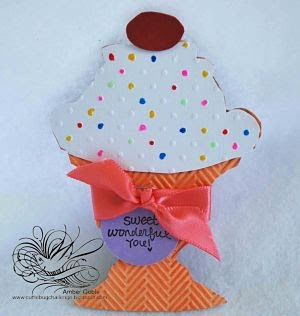 You can visit the Die Cuts R US DT Blog by clicking the name. We will be having tutorials, giveaways (Claudia recently had a Copic Marker giveaway), product reviews, tips, techniques, and features on your favorite scrapbook and card trends. There will be a new challenge listed every Tuesday! I encourage you to sign up as a follower and share this with your scrappy friends. Tune in daily to see what the Design Team is up to! Now it's time to do a little shopping. Hope you enjoy the Die Cuts R Us store!